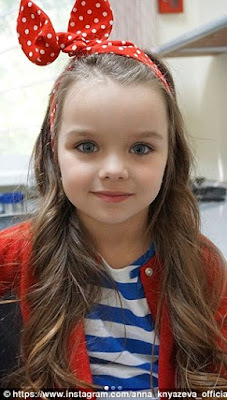 Is she most beautiful girl child in the world? 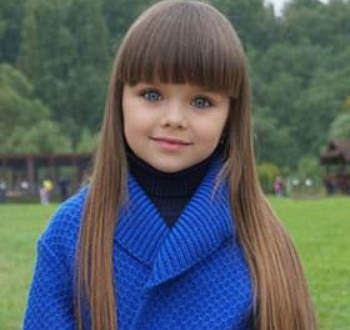 Child model Anastasia Knyazeva from Russia, has already amassed a legion of fans online, who have been wowed by her doll-like features and striking blue eyes. 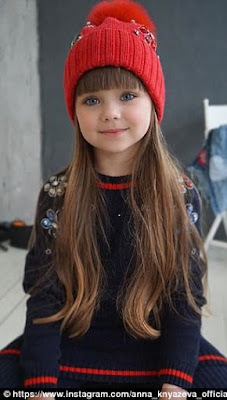 At just six-years-old, the youngster is already a successful child model, having starred in a number of national campaigns including one for the Russian brand Chobi Kids. Anastasia's Instagram account, which is run by her mother, Anna, has half a million followers, and each picture attracts hundreds of comments on the little girl's striking appearance. She regularly posts photographs of the six-year-old's photo-shoots, as well as snaps of her backstage. Each photograph receives hundreds of comments about the youngster's striking features. Her rise comes after Thylane Blondeau (pictured inset left aged six), the daughter of footballer Patrick Blondeau, was infamously hailed as the most beautiful girl in the world when she appeared on the cover of Vogue Enfants as a child. Now 16, Thylane recently walked the runway for Dolce & Gabbana at Milan Fashion Week. The youngster has previously modelled for major brands in Russia, including Amoreco and Kisabiano. She was also voted the face of Little Miss Aoki, a line from luxury couture house Mischka Aoki, in October last year.